Milling machines can endanger operators should they come into contact with the machines’ high-speed rotating draw bars. 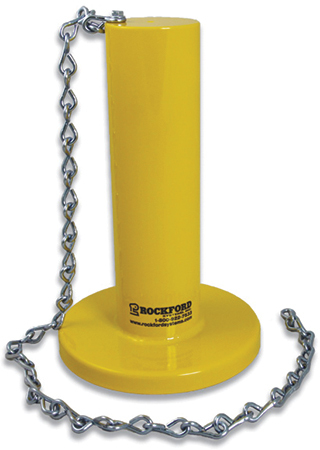 Protect operators from this inherent danger by implementing this new draw-bar cover from Rockford Systems, designed to protect workers from rotating shafts 7 ft. or less from the floor or working platform. The cover guards the turning draw bar with a non-rotating, smooth, welded-steel enclosure, firmly secured to the mill with a ring magnet and a 24-in. zinc-plated steel anchor chain. Simple to install, the draw-bar cover prevents clothing, hair or hands from being grabbed by the moving shaft. The welded-steel enclosure has a 4.95-in.-dia. base and 7.125-in. extrusion, and weighs 4 lb.